2019 is fast approaching, and it won’t be without its fair share of new trends, new technology and new social media terms. So to make sure you’re prepared for whatever it has to offer, we’ve compiled a colossal list of 100 basic definitions that you’ll need to know. media update’s Jenna Cook takes a look at terms you need to add to your social media vocabulary – if you haven't already. An ‘app’ – or application – is a software program designed to perform a specific task, such as a calculator or calendar app. Many social media platforms are available as mobile apps. ‘Augmented reality’ – or AR – is a technology that combines computer-generated images with the user’s reality by superimposing images or text into their view. An ‘avatar’ is a basic image that’s used to represent an individual or business online and differs from platform to platform. For example, Twitter uses an egg-shaped image, while LinkedIn uses a human silhouette. 'B2B' is short for ‘business-to-business’ and refers to operations that take place between two, or more, businesses. These operations can take place on professional platforms, like LinkedIn, which allows businesses to connect and collaborate. 'B2C' is an abbreviation of ‘business-to-consumer’ and refers to operations conducted between a business and its consumers. 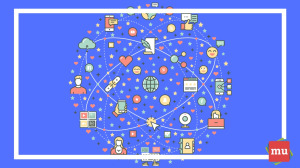 Businesses and brands have the opportunity to connect directly to their consumers through social media platforms. For example, a brand can set up their Instagram account to include an online store. This way, consumers don’t need to leave Instagram when they want to purchase something online. ‘Bio’ is short for ‘biography’. It is a piece of text, usually found within a social media user’s profile, that gives a brief introduction of the user. Your bio will typically contain a succinct summary of the personal information you want to share with others, like your interests, hobbies and likes or dislikes. A ‘blog’ is an online platform where users, known as ‘bloggers’, regularly write and upload content. Blogs are usually written as an online journal of the blogger’s experiences, thoughts, interests, etc. Bloggers can be used by brands as influencers on social media. A ‘chat’ is a conversation that takes place across social media platforms, or online, but specifically by means of a chat interface. These conversations are normally made up of text but have also come to include Emojis, GIFs and video. ‘Clickbait’ refers to online content that is written with the intent of tempting users into clicking it. It can be easily spotted as a sensationalist headline that plays on a user’s curiosity. Clickbait is designed to increase reads, engagement and shares on a platform. The ‘cloud’ refers to a type of Internet-based computing that provides applications, storage and servers on demand. An example is the Apple cloud – iOS users can upload data from their digital devices to the cloud, and download it again at any time. A ‘comment’ is a text-based remark that a user can make on a social media post to express their opinion, reaction or interest. For example, you may have enjoyed a particular article you read on media update and felt the need to share your thoughts by writing a comment that can be viewed by future readers of that article. ‘Connections’ refer to users on LinkedIn who know one another personally or who want to be included in other user’s professional network. Your connections are categorised by the 1st degree, 2nd degree and 3rd degree. 1st-degree connections are people who you have already established a connection with. 2nd-degree connections are people who you may not know but are connected to your 1st-degree connections. 3rd-degree connections are people who are connected to your 2nd-degree connections. ‘Content’ is any original image, video or written media that’s used to convey a particular message or theme. Content is usually distributed across social media in the form of posts, stories and shares. ‘CPC’ stands for ‘cost-per-click’. It’s the money you pay to publishers each time a user on social media clicks on one of your posts. ‘CTA’ is short for ‘call to action’. Your CTA prompts viewers to engage with your post or with your brand. It may persuade the user to do a number of things – from signing up for your latest newsletter to following you on social media. ‘CTR’ means ‘click-through rate’ and is the number of times your post has been seen online divided by the number of users who actually clicked on your post. ‘Deepfakes’ are fake video or audio recordings that are made to look and sound just like the real thing. Recorded footage and machine learning are combined to create false ‘evidence’. A ‘direct message’ is a feature that is used when a user wants to send a private message straight to another user online. To ‘double-tap’ means to ‘Like’ an image or video on Instagram. It’s done by tapping on the image twice with your finger in order to ‘Like’ it. A small, white heart will appear on-screen confirming your ‘Like’. An ‘emoji’ is a small icon that expresses a particular emotion and is typically used on messaging platforms. ‘Engagement’ is any action taken by a social media user. This can be in the form of ‘Likes’, ‘Comments’, ‘Reactions’ and ‘Shares’. ‘Facebook’ – frequently shortened to FB – is a free social networking platform that allows users to stay connected with friends and family by sharing content, chatting on the Messenger platform and engaging with each other’s News Feeds. ‘Fake news’ refers to stories, often spread over social media, that are false or are created specifically to undermine particular views, opinions or values. ‘Facebook official’ – or FBO – refers to an occasion, event or personal status of a particular user that only becomes believable once it has been announced on Facebook. For example, if your job title were to change, it would only be considered official by your social media friends once it had been updated on the social media platform. A ‘filter’ is an option on social media platforms that offers to adjust an image or video before it’s published. Filters can be used to adjust the contrast, brightness or saturation of images and videos. To ‘follow’ means to choose a Facebook, Instagram or Twitter users’ content to appear on your personal timeline. A ‘follower’ is a social media user who chooses to see your posts, or online activity, within their personal timeline – typically on Facebook, Instagram or Twitter. The term ‘Friend’ is used to describe the mutual connection between two users on Facebook. ‘FTW’ is the acronym for ‘for the win’ and suggests that whatever you are commenting on is good. For example, 'What a cute puppy. Dogs FTW'. A ‘GIF’ – or ‘Graphics Interchange Format’ – is a type of image format that stores moving pictures that play without audio. GIFs can be accompanied by an overlay of text, and are often used to express certain emotions or expressions on social media, as well as various content, similar to Emojis. A ‘handle’ refers to a user’s account name on social platforms. Each handle is unique and can be used to find or mention other users on the platform. For example, to search for media update on Twitter, you could use the handle @mediaupdate. A ‘hashtag’ is any word or phrase that follows the ‘#’. Hashtags are used as a way to find content about a specific topic or to make a user’s content more discoverable. For example, if you’re looking for PR content on social media, it might be a good idea to try using ‘#PR’ in your search. ‘ICYMI’ is an acronym that stands for ‘In case you missed it’ and refers to content that may not have appeared in your news feed when it was first published. ‘IMO’ is an acronym that stands for ‘In my opinion’ and was created to suggest that the user is offering their personal view. Unlike clicks, ‘impressions’ are the number of times your content has been seen by other users on social media. So if 100 unique users have seen your post, then you’ll have 100 impressions. An ‘influencer’ is a user on social media with a significant following and who has the potential to provide additional value to a brand. These users are perceived as having authoritative opinions. They often work with brands to create content with a more personalised feel, as consumers find their opinions to be more relatable and trustworthy. ‘Instagram’ is a social media network that prioritises the sharing of visual content, with its main function allowing users to upload images and videos. Similarly to ‘direct messaging’, ‘instant messaging’ is a message sent via a chat interface, through the Internet, and is received by the recipient almost as soon as it’s sent. A ‘Like’ is an engagement used across many social media platforms, such as Facebook, Instagram and Twitter, to show a user’s approval of a post. This is done by clicking on the ‘Like’ button on Facebook, and the heart icon on Instagram and Twitter. ‘Like-baiting’ is a popular way for users on social media to ask for ‘Likes’. They do this by including a request for ‘Likes’ within the caption or tags. For example: #TagForLikes or #LikeForLike. ‘Live stream’ is the transmission of live video or audio content through social media platforms. ‘Live tweet’ refers to tweets being written and published about an event or situation while the user is actively involved in or present at the particular event. A ‘meme’ is a captioned image that typically pokes fun at particular human behavior, celebrities and politicians or philosophical content. A ‘mention’ is when a user’s handle is tagged in a tweet. For example, ‘Hey @mediaupdate, take a look at this cool infographic’. ‘Mutual’ refers to following, friending or connecting with a user on social media who has also followed, friended or connected to you. Your ‘News Feed’ on Facebook is the place where you can view all the content and updates from the people you’re friends with. A ‘notification’ is used to inform you that you have received some sort of engagement on a particular social media platform. It may show that you’ve been tagged in a post or status update, received a friend request or that other users have liked your posts. ‘NSFW – or ‘Not safe for work’ – refers to content of a particularly inappropriate nature that shouldn’t be opened, or viewed, at work. ‘Organic reach’ is the number of users who have seen your unpromoted content. These are people who already follow you on social media. ‘Owned media’ is any content you create, publish and have control over. ‘Paid media’ is the promotion of your owned media through search engine marketing (SEM) and boosted posts. ‘Pin’ refers to any image or video that has been shared on Pinterest. An image or video that has been ‘pinned’ has been saved onto a user’s pinboard on Pinterest. ‘Pinterest’ is a social media website that gives users the opportunity to share images and videos on customisable digital pinboards. Users can follow boards created by their friends or create their own personalised boards that are filled with everything they pin. A ‘podcast’ is an audio file made available online that subscribers can download to their computer or smartphone. Podcasts can cover a number of topics, subjects and themes and are often recorded in a conversational manner. A ‘post’ is any form of content that has been published onto a social media platform. ‘Pay-per-click’ refers to a digital advertising model where advertisers pay the publishers or host a fee every time their ad is clicked on. Your ‘profile picture’ is the image that you select to replace the avatar on your social media profile. 'PV' stands for ‘page views’ and alludes to the number of times your page, i.e. profile, is visited. The ‘reach’ of a particular post on social media refers to the maximum number of people who can see it. For example, if your page has 100 followers, the maximum number of people who can see your post is 100. However, if one of your followers shares the post, its reach will automatically be increased by the number of people who see it because of that share. On Facebook, a ‘reaction’ works similarly to a ‘Like’, but a user can choose to be more specific in their expression by choosing to either love, be excited, angry or sad in response to a particular post. ‘Reddit’ is a social news site and online forum where users can rank the content and other users through a voting system. The more votes a particular piece of content receives, the more promotion it’s given by the site. A ‘reply’ is when one user responds to the comment of another user on a particular post. The user will typically begin their response with the user’s ‘@’ handle. A ‘retweet’ takes place on Twitter and occurs when a user reposts another user’s original tweet onto their own newsfeed. ‘Return on investment’ measures the profitability of an advertising campaign. In terms of social media advertising, it measures the profitability of published posts. An ‘RSS feed’ – or Really Simple Syndication – is a computer system designed to distribute content from an online publisher to other Internet users. It allows users to convert files from multiple sources into a single, compact, easy-to-read format. A ‘selfie’ is a photograph you take of yourself. This is typically done by using a smartphone and by pointing the camera at yourself at an arm's length distance. ‘Search Engine Marketing’ falls under the umbrella of Internet or digital advertising and involves the promotion of a brand or a website. Social media can be used as part of your brand’s digital marketing strategy as a way to connect with your consumers on a more direct level. ‘Search Engine Optimisation’ is the process of increasing a website’s ranking on search engines, such as Google or Yahoo, through a number of strategies and techniques. Social media’s basic function for your brand would be to increase your online visibility and brand recognition, thereby improving your SEO. The ‘share’ feature allows users to re-post other users’ content to their own timeline. ‘Shared media’ is the word-of-mouth equivalent of the digital advertising world. The purpose of shared media is for consumers to leverage brands online. Consumers do this by taking original, owned content and sharing it across their own social media platforms. ‘Skype’ is a live streaming social platform that allows users to have videos calls over the Internet. ‘Snapchat’ is a social media network that gives users the power to communicate through images and videos, rather than text. It’s synonymous with the multitudes of filters and sound effects that users can use to edit their content. Snapchat’s also unique because posts can't be saved or forwarded, and the content is ephemeral, meaning it only lasts for a set period of time. And if a post is sent to a group of people, it is received as an individual message by the recipient. A ‘social network’ is an online platform where users can connect with one another by posting images, videos, updating statuses and building their friend base. A ‘story’ is a collection of photos or videos compiled into one album on a users’ profile, which can be viewed by other users. Stories are ephemeral and are usually limited to a 24-hour period before expiring from a particular user’s Instagram, Snapchat or Facebook profile. They have been popularised as a way for users to share behind-the-scenes content or content that they don’t want on their page permanently. A ‘tag’ is typically used to mention a particular person, or business in a social media post or to identify them in an image or status update. It’s done by simply including the handle of the person you want to tag in your post, image or status. ‘Tag locations’ allows you to tag your image with the exact geographic location that your post was published or created. For example, if you’ve taken a picture of Brooklyn Bridge in New York, you’ll be able to tag that particular image with ‘Brooklyn Bridge, NYC’ and people who view this will easily be able to identify the location of your image. A ‘thread’ refers to the sequences of comments on a particular social media post. It is more commonly seen on online forums – like Reddit or Tumblr. Your ‘timeline’ on social media is a display, usually on the landing page of a platform, that showcases posts from people that you either follow or are friends with. The posts are shown in a particular order based on their popularity and your viewing preferences. Most timelines will include the date and time that a post was published. ‘TL;DR’ – or ‘Too long; Didn’t read’ – refers to content that has been ignored by a user because it is too long or detailed. ‘Trending’ refers to a particular topic or subject that becomes popular on social media, for a certain amount of time. For example, many online movements are sparked by popular hashtags, like #metoo or #blacklivesmatter. A ‘troll’ is someone who enjoys creating conflict. They do this by making controversial comments or posting hateful content on social media with the sole purpose of eliciting an emotional reaction from other users. ‘Tumblr’ is an online social network that acts as a micro-blogging platform where users can not only upload original short-form content but also follow blogs that interest them. A ‘tweet’ is a short, text-based message, limited to 280 characters, that can include images, videos or hyperlinks. Tweets are posted on Twitter. ‘Twitter’ is a free social media platform that allows users to quickly post short pieces of information in the form of tweets. It was initially intended to be a messenger platform, like WhatsApp, but rapidly evolved into a news broadcasting service, among other things, that has changed the way users stay up to date with events. ‘User-generated content’ is content about a brand that has been created and shared by consumers who have no affiliation with the said brand. ‘UI’ is short for ‘user-interface’ and refers to any design elements that the user of a particular platform may interact with. UI includes things like the double tap feature on Instagram, or the reactions feature on Facebook. To ‘unfollow’ means to remove a user from your list of contacts on social media. Once a user has been unfollowed, you will no longer be able to see their content on your timeline or newsfeed. ‘Unfriend’ means to end a mutual relationship on Facebook and remove the user from your contacts list. ‘User-experience’ refers to the encounter users have when interacting with a particular platform. This includes the platforms usability, functions and features and overall design. ‘Views’ refers to the number of times a particular video has been watched by users or the number of times a particular page has been seen, on a specific social media platform. A ‘vine’ is a short, typically six-second clip of a humorous nature. It was made popular by the social networking site Vine and was discontinued in early 2017. The term ‘viral’ speaks of any form of content that is quickly shared from one social media user to another, or multiple users, with help from the Internet. ‘Virtual reality’ is a type of audio and visual technology that simulates a seemingly real environment with which users can interact. Social media platforms, like Facebook, have adopted VR technology to create 360-degree video and photo content. This allows users to view posts in a complete 360-degree experience. A ‘vlog’ is an online space, usually a website, where users – known as ‘vloggers’ – regularly record and upload videos. ‘WhatsApp’ is a mobile-centric messenger platform that allows users to send text messages, images, video and audio files via the Internet. ‘YouTube’ is a video-sharing platform where users can upload videos that can be viewed by anyone on the site. Users can create their own ‘channels’ where their content is shared and can follow other channels as well. Video has continued to show a rapid amount of growth on social media over the last few years, and many brands have taken note. Read why in our article, Three reasons why video is dominating on social media in 2018.